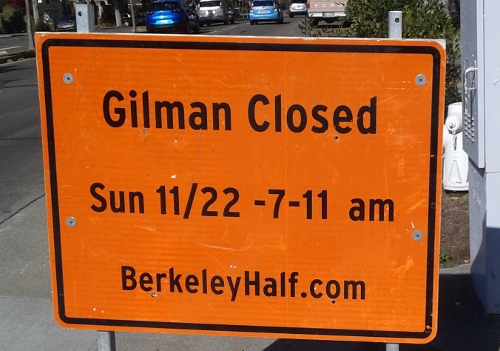 The annual Berkeley Half Marathon is scheduled for this coming Sunday morning, 11/22, from 7 AM to 12:30 PM. Once again, BFC is inside the race course, and anyone coming from outside the course will have difficulty crossing it in a car. If you usually come in a car or by bus, please walk, bike or take BART if you possibly can. 1) Avoid I-80 at University Avenue. This exit will be entirely closed. If you come before 8:40 AM, you should be able to get across the course from the south on Sacramento Street or San Pablo Avenue before they close them at Channing/Bancroft. If you come after 9:45 AM, you should be able to get across from the east on Hearst Avenue after they re-open it at Shattuck Street. Getting to Hearst & Shattuck from the south (e.g. from Tunnel Road/Ashby Avenue), you will need to get around the UC campus on the east. Go north on College Avenue to Dwight Way, right onto Dwight (crossing Piedmont Avenue), and then left onto Prospect Street until it ends. Turn right and then almost immediately left onto Canyon Road. The UC football stadium will be on your left; keep left on Stadium Rim Way, continuing around the stadium. The next four-way intersection (the third stop sign) after this is Gayley Road; turn right. In a few blocks Gayley exits the campus at Hearst; turn left. Hearst should be clear all the way to Sacramento St after 9:45. Between 8:40 and 9:45, there will be intermittent crossings allowed on Sacramento at Bancroft/Channing, San Pablo at Bancroft/Channing, and Hearst at Shattuck. However, the police will not let people through very often. The wait at those crossings might be as long as a half-hour (!!). And if you have any further questions, check with Brian!